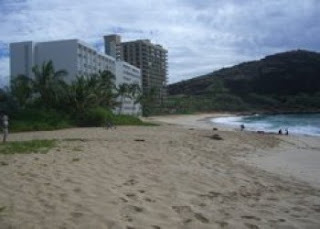 Makaha Beach Cabanas is called a "Solid Gold Value" in the "Oahu Revealed" guidebook. Located in West Oahu, this condo is located on a picture perfect, never crowded sandy beach. This second floor unit has a queen bed, queen sofa sleeper, dishwasher, ceiling fans, snorkel gear, wireless internet and large flat screen TV. The covered lanai overlooks the beautiful blue Pacific where you can see dolphins and sea turtles swim! 40 min from airport, 1 hour from Waikiki. $120/nt high season Dec 1 -March 31. $100/nt the rest of the year. 13.97% TAT and GE tax. $100 refundable damage deposit required. Email us for price quote, more pictures, and more info!